Yesterday was an amazing day of exploration and learning. We set out 9 children, three adults and a love for adventure. We slowly made our way to Dow's Lake and the Arboretum. The air was fresh and the smell of rain filled our senses. Right from the beginning the gifts of nature presented themselves. Along a path purple red clovers swayed in the wind. We harvested some for a yummy tea to be made later. 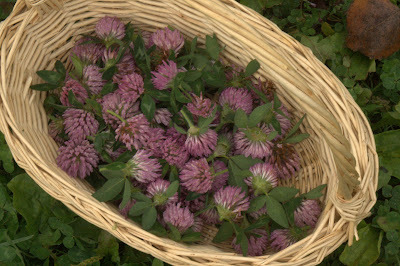 Red clover is an easy plant to find, it grows abundantly in fields, along roads and in your backyard! It's sweet flowers are sweet and delicious. It contains minerals such as calcium, magnesium, chromium, potassium, and vitamins such as niacin, thiamine and vitamin C.
As we wandered through paths and the woods plenty of surprises came our way. We saw ducks, a perfect climbing tree and rolled and climbed a big hill. In the forest there are no toys, no tv, no books and yet children play with abandon, boredom is far away in a distant land. I've said it before and I will say it again. 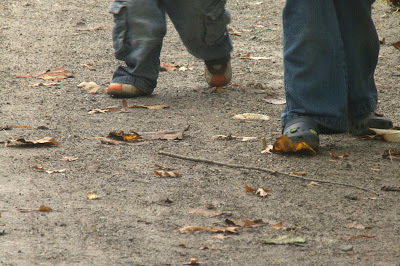 Rearing children in the great outdoors is easier. Children play freely, smiles are abundant and life is good. We arrived back home, smiling and full of joy for nature's playground. Interested in joining us in our next adventure? We welcome you to be part of our group. Goodies for stuffing : chopped walnuts, raisins, date pieces, currants etc..
Place the apples in a baking dish and add about 1/4 inch of water. Serve in bowls with a bit of milk or cream if you like. A hearty and delicious snack! Three Little Monkeys on Bank Street ordered some balls and I am busy felting away. It's their second order which is quite exciting. Making the balls is quite time consuming so really I am not getting more money for my time but am getting lots of satisfaction. Next step is to create felting kits :) Every time I felt I am reminded of how I love the feel of the wool, it's warmth and the feelings of healing that it evokes in me. I've said it before and I will say it again creating things makes me happy. Fall equinox; equal night and day. What a celebration! When I gather with friends to celebrate the changing of seasons it evokes inspiration and a feeling of belonging to a wonderful group of friends. My children feel the same. Upon our return last night Zoe gave me a heart felt hug. Her squeeze was infused with love and joy. It was one of those special moments that I hold dear to my heart. 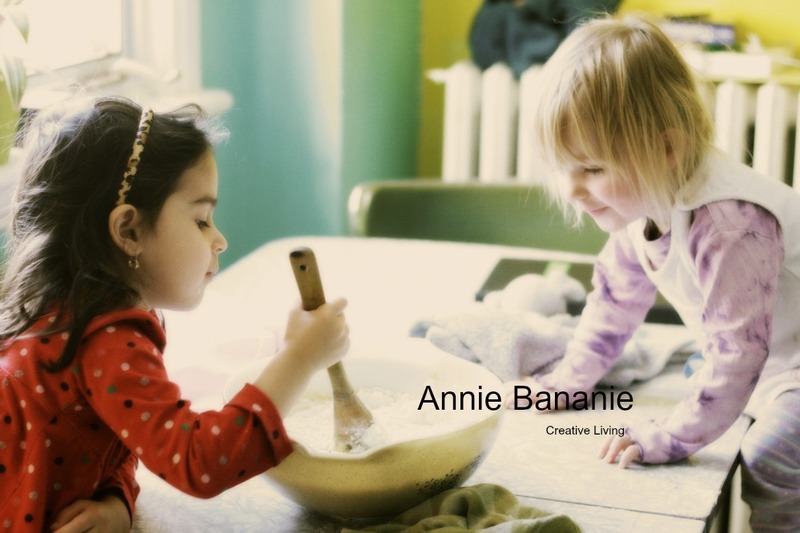 These gatherings are magical, children play freely, expressing who they are. "All I really need is a song in my heart. Our variety show was amazing with a witch, puppet show, songs and fall yoga! "May the long time sunshine up on you! Unpacking I came across this and thought I would share. Think of no one as "them"
Look at the moon, Imagine someone else, somewhere else, looking at it too. Understand economics in terms of people, land and water. Know where your water comes from and where your waste goes. Water colour painting is fun and beautiful. As the paint hits the water soaked paper, colours dance, spiral and spread into stars and shapes. An untold story unfolds as colours meld into one another transforming into other colours. Afterward we are left with beautifully coloured card stock to get even more creative with. We transformed these paintings into invitation cards for the parents of Crescent Moon Daycare. Each card invited them to our first pot luck which was a great success. In time seeds grow into stems, stems into leaves, to flower into vegetables and fruit. This spring Naomi, Sarah and their children had a tangible experience of plant life. They planted seedlings and through the summer cared for the plants and watched them grow. Today we journeyed to their garden which is situated behind Umi Cafe. This mecca in the heart of center town is a community initiative. Immediately upon arriving we found ourselves having fun in the abundance of nature's gift. Plants were taller than the children and they loved walking through the tall stalks. Big and small, green and red tomatoes dangled from their stems, small hands grasped the fruits. Some tomatoes found themselves into baskets and others fed hungry bellies. The journey from a seedling to a nutritious food is what we as care givers want to impart on our young ones. Also, what a great way to learn about biology and the workings of mother nature by being part of the process and living the experience.